Dr. Zhang’s method for Spectral Decomposition, Real Seismic Wavelet Transform (RSWT), uses a real wavelet extracted from the seismic data instead of a ideal wavelet derived from a mathematical expression (the technique used in most Spectral Decomposition methods). The extracted wavelet is numerically squeezed and stretched, and then convolved with seismic trace. The result shows much less ringing or side lobe effect than the result from Spectral Decomposition using a Continuous Wavelet Transform (CWT) but has the same high resolution characteristics as CWT. 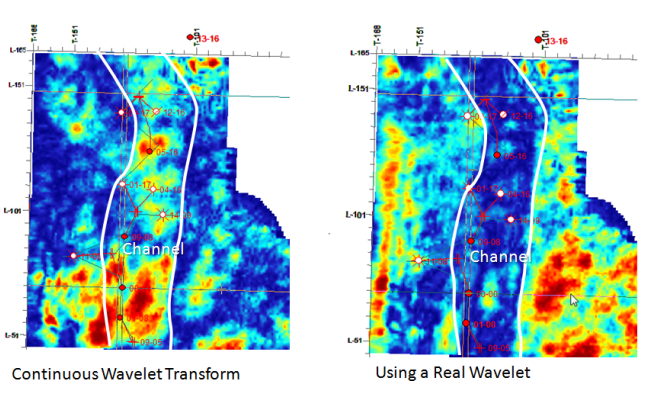 The new RSWT method removes side-lobe effects and, as shown in the pictures above and below, can produce improved definition in areas of channel and valley fill. This new RSWT method for Spectral Decomposition will be included in AttributeStudio 7.4, to be released later this month. If you would like to see it in action, come by our booth (#1857) at AAPG in Houston, April 6-9, 2014 or contact us using the form below to schedule a presentation and demonstration.